“I Swear” is a ballad written by Gary Baker and Frank J. Myers that became a hit for two acts in 1994. Initially it was a number one song on the U.S. Hot Country Singles & Tracks chart for John Michael Montgomery at the beginning of the year. His version crossed over to pop radio and climbed to number 42 on the Billboard Hot 100. 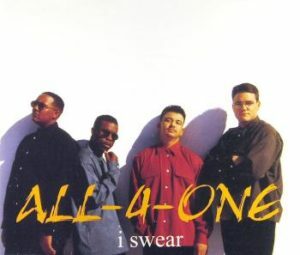 A few months later, All-4-One covered the song and achieved a great success in many countries. This version was ranked at number 78 on Billboard’s Top 100 songs in the 50-year history of the Billboard Hot 100 chart. The song was the twelfth biggest selling boyband single of the 1990s in the UK. In Swedish, two lyrics versions exist. One of them, “Jag svär” (“I Swear”), was written by Ingela “Pling” Forsman and recorded by Sten & Stanley on the 1995 album Musik, dans & party 10. The other, written by Anica Olsson, is called “I dag” (“Today”) and was recorded in 1996 by Anders Engbergs as 2nd track on the single “Av hela mitt hjärta”, and by Lotta Engberg and Jarl Carlsson i a duet on their 2005 album “Kvinna & man”. In 2003, American boy-band group B3 covered the song on their album N.Y.B3. English (not Chinese) version was recorded by 4 female Chinese singers, Sandy Lam (HK/Taiwan), Prudence Liew (HK), Teresa Carpio (HK) and Chyi Yu (Taiwan), in Sandy Lam’s English album “I Swear”. It was released by Rock Records of Taiwan in 1996. The arrangement is similar to the All-4-One’s.